Plant of the month. April 2016 DWARF BURNING BUSH IS NOT THAT DWARF! – Glacier View Landscape and Design, Inc.
Euonymus alatus and the compact variety Euonymus alatus ‘Compactus’ are popular shrubs that are planted in many Boulder Colorado Landscapes. However, their popularity has meant that this landscaper has had to remove many of them because of poor placement. You see, people who are not familiar with these plants think that the term “dwarf” means that the plant will remain 1-2 or maybe 3’ tall at most. The dwarf variety of Burning Bush will get 6-8’ high and wide, and the regular Burning Bush will achieve a height of up to 12’ high and wide. So, that nice little shrub in the number 5 size pot becomes a monster that overtakes their front porch in 5-8 years. That is definitely not what the gardener had in mind! Let’s set the record straight. these shrubs are for larger properties or commercial applications, not small subdivision backyards or front porch entrances! 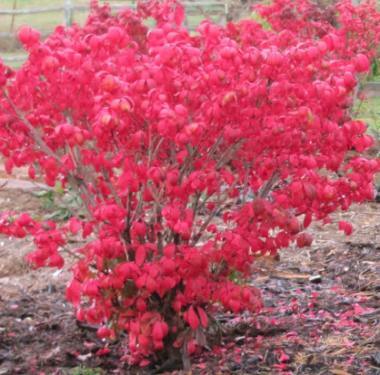 Native to Northeast Asia, Japan and central China, Burning Bush was introduced into the landscape in the Eastern US in 1860 and was popular almost immediately for its intense fall color. However, it soon became known as an invasive species, especially east of the Mississippi due to ample moisture for seed dispersal and germination naturally. Here in Colorado, that is much less of an issue and it is generally not known to become invasive. State Extensions in the Eastern US suggest to eradicate it. They are still widely sold throughout the US and are especially popular in Colorado. Now, that said, let’s talk about how beautiful they are, especially in the fall. They have a cork like bark that exhibits 4 wings along the stem which makes them easily identifiable even without leaves. They grow to be flat topped with small ovate shaped leaves about the size of a quarter. New growth is a bright light green, making them distinctive in the landscape. They require moderate water, full sun, and ample room to grow. They can be pruned, but fill out nicely without shearing. Their flowers are inconspicuous to non-existent. Their show stopping highlight is their profuse burning flame red color in the fall. It cannot be missed along the Front Range of Colorado in late September and October. They are truly stunning. Chose a location wisely and plant several in a grouping in an open area of your property and you will be amazed at the splash of fall color it adds to your landscape.